For years Egypt and its ancient historical sites have been depicted in numerous books and films, but to truly appreciate its magnificence and splendour you have to experience it first-hand. Join us on an unforgettable adventure along the longest river in the world - the Nile. Find out more compelling reasons to visit: read our blog post here! It's almost as if we step back in time as we cruise along this enchanting river. We cover the Egyptian stretch between Luxor and Aswan encompassing a treasure trove of Egyptian antiquities, many fascinating sites and historic legends. 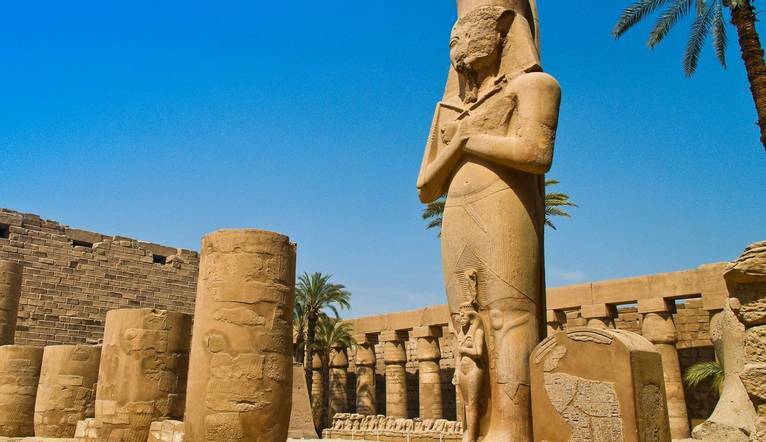 There are guided tours of mighty temples, such as Karnak and Luxor, plus the tombs of the Valley of the Kings. During the cruise there is also an opportunity to visit mesmerising Abu Simbel. After breakfast and our welcome meeting our sightseeing of some of the amazing East Bank sites begins: the wonderful Temple of Luxor with its giant columns and avenue of sphinxes and the enormous complex of Karnak, as seen in James Bond, 'The Spy Who Loved Me' amongst many other films. In the evening, we will sail on towards Esna. Upon arrival in Edfu we have the option to visit mighty Edfu Temple, dedicated to the falcon god Horus. From here we sail on to Kôm Ombo. Our sightseeing includes a visit to the magnificent Temple of Kôm Ombo, dedicated to falcon and crocodile gods, followed by a leisurely cruise towards Aswan. Upon arrival we take a tour of the Philae Temple complex on Agilika Island. Today we have a free day in Nubian-influenced Aswan, with time to visit the fascinating markets or take an optional excursion to the great Temple of Abu Simbel. This impressive temple is home to the four 60ft high seated figures of Pharaoh Ramses II. In the afternoon we sail on a felucca boat, passing by a botanical garden and the Agha Khan Mausoleum. Today we have a day on board to relax and watch the stunning scenery sail by as we cruise back to Luxor. West Bank sightseeing of the Necropolis of Thebes, including the Valley of the Kings, Temple of Hatshepsut and the Colossi of Memnon statues. Impressive from the outset, our ship is elegant, personal and luxurious. Sit back and relax as we are entertained on board. Our cabins are located on the main deck and all feature large panoramic windows, private facilities, air-conditioning, satellite TV, mini fridge and safe. Extensive facilities to enjoy when we are not out sightseeing include a bar and lounge, restaurant serving breakfast, lunch and dinner, sun deck with swimming pool and pool bar, table tennis, jewellery and gift shop, massage, laundry service and internet (charges may apply for some services). Afternoon tea is also served on the sun deck. Upgrade to a Higher Deck, please contact us for more details. You can get a visa online at Visa2Egypt. Tourist visas granted using the e-visa system are valid for a maximum of 3 months. It is also still possible to get a tourist visa on arrival. You can get a visa on arrival by payment in Sterling, US Dollars or Euros; the visa fee is US$25 at approved bank kiosks within airport arrival halls, before reaching immigration counters. Visas granted on arrival are valid for a maximum of 30 days. There’s no need to buy a visa from an agent. In many cases agents will charge more than US$25 for a visa. If you’re harassed by an agent, report the incident to the tourist police in the airport terminal. You may also get a visa from an Egyptian Consulate outside of Egypt before you travel. The transfer time for the main tour between Luxor Airport and the ship is approximately 30 minutes, depending on the traffic. NB: A reasonable level of fitness/mobility is required as we include plenty of sightseeing/travelling, sometimes with early starts. There are no hairdryers in the cabins so you do need one, please take your own.